We spoke with John Swapceinski, co-founder of the Ratingz Network, which runs over a dozen review sites. Swapceinski got his start in the rating business when he founded RateMyProfessors.com in 1999, a site for college students to review their teachers (which he sold in 2005). In 2004, he started RateMDs to let people review doctors, and in 2005 he co-founded LawyerRatingz, RealEstateRatingz, VetRatingz, and more as part of the Ratingz Network. As Swapceinski put it, the rating of professional services was "a niche that a lot of bigger companies had historically stayed away from." Negative reviews can draw legal threats, and such threats can deter innovation. Such sites, however, are protected by CDA 230 for this very reason. The law protects intermediaries from being liable for third-party content—a necessary protection for review sites to exist. After negative reviews about a Florida law office were posted on LawyerRatingz, the firm went after Swapceinski's company. EFF, armed with CDA 230, represented LawyerRatingz, and the opposing firm backed down. Tell us a little bit about yourself and the Ratingz sites. I'm the founder of RateMyProfessors, and that's kind of how I started in the rating business. That was started in 1999. In 2004, I started RateMDs. Then in 2005, I cofounded the Ratingz network, and under that corporation we have the lawerratingz site, veterinarians, child care, etc. RateMDs gets 2.5 million visitors per month. LawyerRatingz gets about 250,000 visitors per month, but is growing at 50% per year. LawyerRatingz causes us the most trouble in terms of legal threats and actions. It's been pretty problematic. Even as small as it is, it generates a lot more trouble for me than the doctor ratings site. Wow. Though I guess that's not that surprising, knowing lawyers like we do. What types of complaints or legal threats have you encountered regarding user content? What are the most common legal issues you see? Lawyers accuse us of libel quite a bit. A lot of times the attorney knows that we're not actually the ones who author the ratings, but there are a lot of lawyers out there that use the threat of legal action as a club against small websites to try to beat them into submission and basically scare them. The other suit that we saw a lot of in the past, though it's not as common now, were frivolous DMCA takedown notices filed against us. Usually the reason in the complaint was, "I never gave this person permission to use my name, so they're infringing copyright." Once I learned about the DMCA process, those were fairly easy to combat. I would take the content down, and then file a DMCA counterclaim, and after a week, if we weren't sued, then we would be able to put the content back on. We saw this the most with our doctor rating site. There had been a site called Medical Justice that provided legal advice and told doctors to file these DMCA notices. How do you respond to such complaints or threats? For example, what if someone complains about allegedly defamatory content? When I get a complaint, I take a look at the ratings and read them. If there's an allegation of illegal activity, I basically tell them, "Look, you need to report this to the police." If there's a lot of profanity or just name calling, I may take that down too. Other than that, we usually let the rating stand. I generally do not respond to the person who complained. Usually that person just goes away. A lawyer once sent us the text of a lawsuit they were about to file—and in that case I contacted EFF and they filed a motion for a declaratory judgment against the lawyer. It surprised the pants off the lawyer that threatened to file the lawsuit. What kind of staff do you have dedicated to reviewing complaints? It's only two of us: me and my business partner. So it's very small. We have a couple other people that work on the doctor rating site, but all of these sites are small in terms of staffing. We don't charge for any of the information, and it's just advertising driven. What would it mean to your business and your users if you could be held legally responsible for all of your users' posts? We'd have to shut the sites down, for sure. There's no way we would survive even a month. We get so many legal threats. On the lawyer site, we probably get one every day or two. They're not actually filing a suit at that point, but they're threatening to. If they actually could hold us responsible, all these sites would have to be taken down. When did you find out about CDA 230? I'm just a computer programmer. I didn't really have a background in business. I've had to learn it as I went along. EFF has been a big help. Your website has a lot of information on it. When I started getting DMCA takedown notices, I started reading about what it was and how to fight it. I couldn't find much at first, but I finally did through googling and EFF. 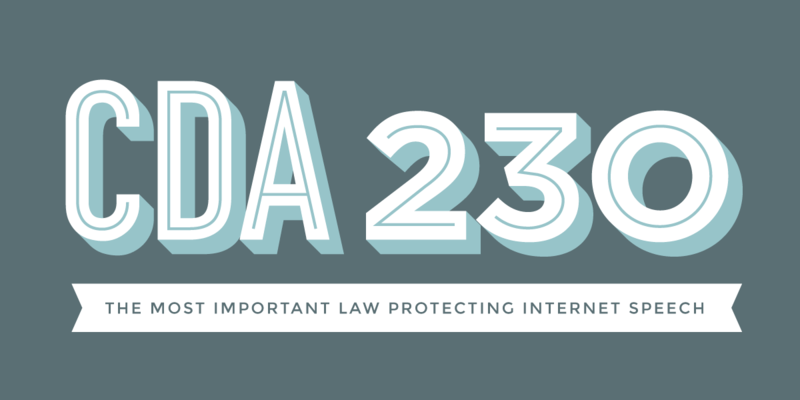 Do you think that the protections of CDA 230 should be narrowed? Increased? What other changes could be made to help protect online intermediaries like LawyerRatingz? I do have some qualms about the fact that a website can leave untrue content up. Even if I knew there was libel on my site, I can just leave it up there. I have a little personal problem with doing that. There have been some postings where it's pretty clear, and when they were brought to my attention, I have taken ratings down. Legally I don't have to, but sometimes I do feel sorry for certain people who get rated unfairly on our websites. On the whole, CDA 230 is a fantastic thing. It's so closely intertwined with the First Amendment. If we didn't have it, the First Amendment wouldn't mean much. If you look at other countries around the world, the U.S. is the only country where we have this kind of protection—the only country where you can run a rating site like the one that we run. Even in Canada, we'd be blown out of the water. When you look at other countries, like those in Europe, it's even worse. And these are democracies that purport to have freedom of speech! One of the nice things about the United States is that it's a haven for free speech. The rating industry and the ability to have rating websites... that really is a good thing, I think. Being able to rate a doctor or a lawyer is really a good thing. There are just so many benefits. The websites on the Ratingz network are just a few of the many examples of sites and services that owe their existence to CDA 230. Stay tuned for further CDA 230 success case profiles.